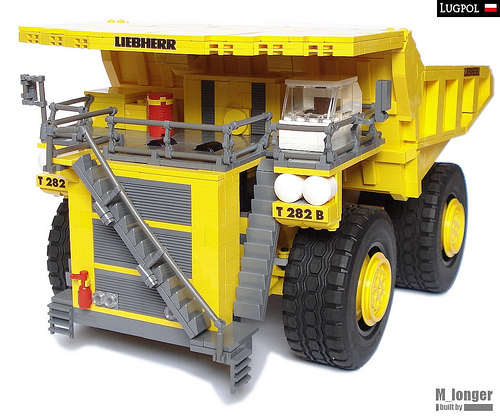 We’ve featured many gloriously oversized LEGO vehicles by Marek Markiewicz (M_longer) over the years, including his L 580 wheel loader, TH550 underground mining truck, and Caterpillar 24M grader. Marek’s latest truck is the massive — and fully motorized — Liebherr T 282B haul truck, used in mining and heavy construction. Marek’s model is fully functional, with working steering and tipper. You can watch this beast in action in his video on YouTube.